The Habsburg Kings of Spain descended from Queen Joanna "The Mad" of Castile (1479-1555), who was mentally unstable and prone to fly into rages. Her descendants increased her inheritance by inbreeding: they preferred to marry either their cousin or their niece. These incestuous marriages resulted in the mentally and physically handicapped King Charles II (1661-1700), who possessed the physical peculiarities of the Habsburgs to an extent that made him little short of a monstrosity. The Habsburg King Charles II of Spain (to the right) was sadly degenerated with an enormous misshapen head. His Habsburg jaw stood so much out that his two rows of teeth could not meet; he was unable to chew. His tongue was so large that he was barely able to speak. His intellect was similarly disabled. His brief life consisted chiefly of a passage from prolonged infancy to premature senility. Charles was unable to walk properly, because his legs would not support him and he fell often. His body remained that of an invalid child. He was a mentally retarded and hypersensitive monarch, who grew steadily worse over the years. By the age of 35 his hair had fallen out, his teeth were nearly gone and his eyesight was failing. "Many people tell me," Charles II once said, "I am bewitched and I well believe it; such are the things I experience and suffer." 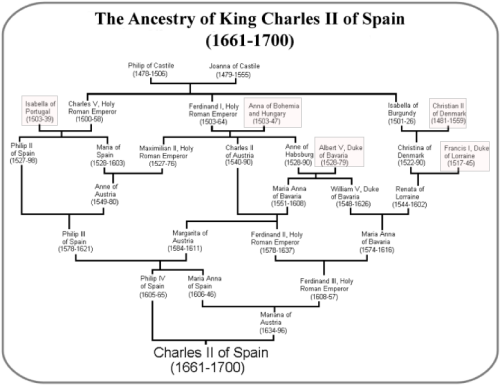 Charles II of Spain was the result of generations of inbreeding within the Habsburg family. His mother was a daughter of his father's sister who had married her cousin the Emperor Ferdinand II. His great-grandfather, Philip II of Spain, too, had married a daughter of his sister who had married her cousin the Emperor Maximilian II. As a result, Charles II of Spain descended multiple times from Joanna "The Mad" as shown below. The inbreeding coefficient of the Spanish Habsburgs increased strongly along generations from 0.025 for Philip, husband of Joanna "The Mad", to 0.254 for Charles II. In addition to inbreeding due to unions between close relatives, ancestral inbreeding from multiple remote ancestors makes a substantial contribution to the inbreeding coefficient of most Kings. It is speculated that the simultaneous occurrence in Charles II of Spain of 2 different genetic disorders (a hormone deficiency and tubular acidosis) that are determined by recessive alleles at 2 unlinked loci, could explain most of the complex clinical profile of this king, including his impotence and infertility which led to the extinction of the dynasty.